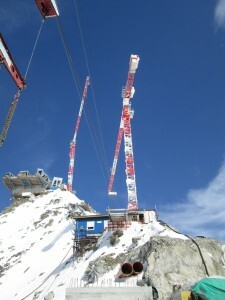 Between € 105 and € 110 million (four times the “Vanoise Express” that links “La Plagne” to “Les Arcs”, according to the French Newspaper “Dauphiné Libéré”) were invested in the development of this off the scale project commonly presented as the world’s biggest cable-car work site. Four years of colossal work, above 3000 meters, were required for a targeted opening in May 2015, during the International Fair of Milan. 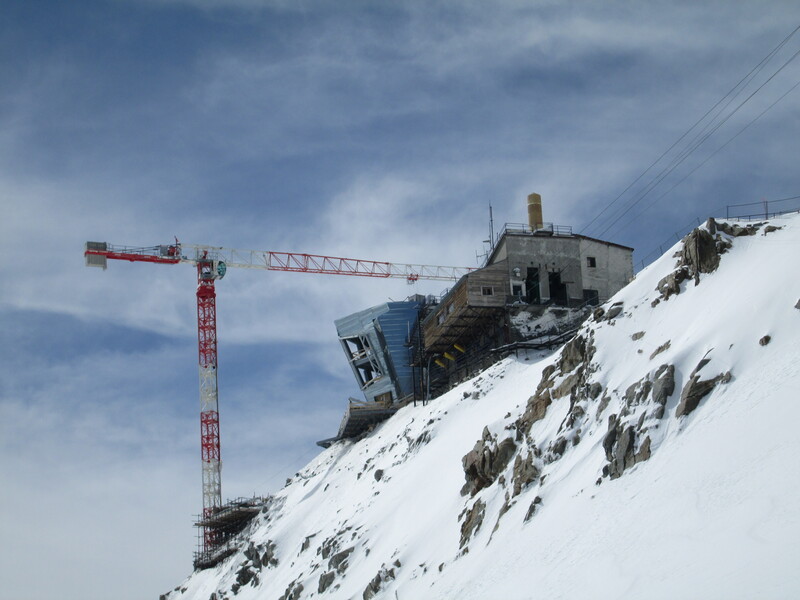 Since 1947, an obsolete facility carries, in three stages, less than one hundred thousand passengers per annum (tourists, mountaineers and off-piste skiers) from Courmayeur to the Torino hut, a gate to the high flanks of Mont Blanc. 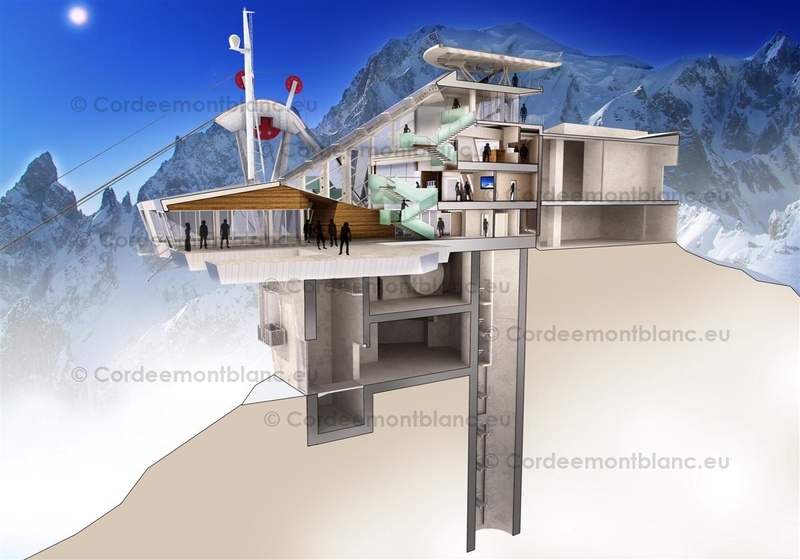 The cable-car that replaces it, one of the most modern in the world with its large ovoid and rotating gondolas will allow the passengers to enjoy 360 ° sightseeing throughout the journey before reaching the glacier area of the “Vallée Blanche” (White Valley) at 3452 m above sea level. In two sections, The new cable-car will take up to 500,000 visitors each year to the high mountain, despite a capacity of 600 passengers/hour, limited to 3000/day, over 3 times the current capacity. But with a € 27 million cost the transport system it is only a fraction of the total investment. At the top of Helbronner, which was significantly re-shaped, a 80 meter vertical hole long has been drilled into the granite to receive a reinforced concrete tube with the purpose of stabilizing the platform receiving the new cable-car station. A real wound inflicted on the mountain. In this tube, a lift will transport the visitors wanting to go to the Torino hut thanks to a 150 m tunnel appended at its lower end. A comfortable glass viewing platform for resting and contemplation. The “Step in the Void.” A glass box suspended above the abyss. A reorganization of corridors to make them more attractive and to help educate visitor on aspects of the high mountains. 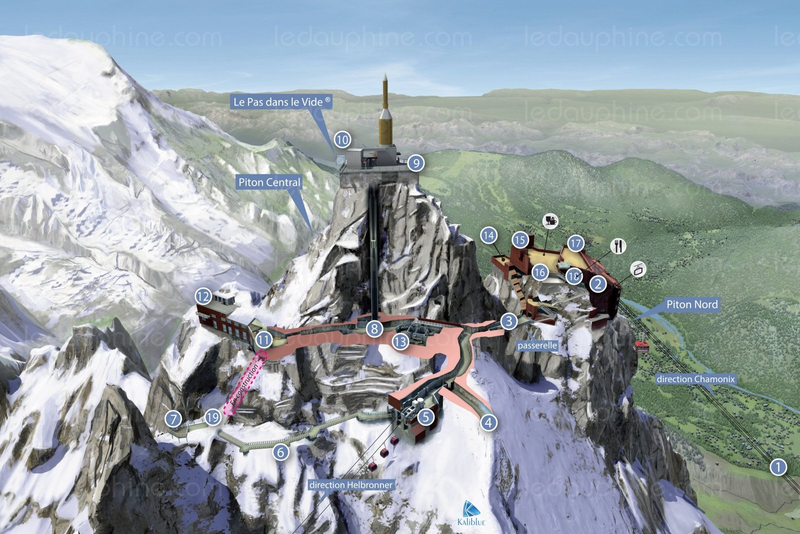 With 500,000-800,000 passengers carried each year (depending on sources), the Aiguille du Midi is the star of the mechanical installations on the Mont-Blanc and its operating company (The Mont-Blanc Company) intends to keep it that way. Through a partnership with its Italian counterpart it can be expected that resources will be optimized across the mountain. 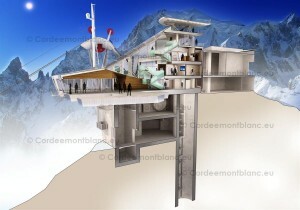 This leads to scrutinize what is happening to the cable car of the Vallée Blanche, the link between the two sides. A renovation project at the Pointe Helbronner arrival station, which shows obvious signs of decay and strongly contrasts, in its current state, with the gigantic “Funivie Monte Bianco” facilities, is planned. At the same time the safety of the French station will be enhanced to higher standards while keeping passenger capacity at current levels. The project mainly consists of reconditioning the existing building by harmonizing its various disparate elements while respecting its current structure, and in the dismantling of a snow-cat shelter and a ski lift pylon used during the heyday of summer skiing. Its ground surface will remain unchanged, hence little direct impact on the environment, other than the maintenance of the current state and an option to increase traffic later. For many years, the gondola was considered by Mountain Wilderness as a wart denaturing this unique high mountain environment by its incongruous presence. It is the subject of an ongoing controversy since the creation of the association. Other environmental organizations consider that this facility offers an ecological alternative to commercial flights for those tourists who want an oversight of the range. The tough reality is that commercial flights continue to flourish. The impact of the installation is not neutral in terms of traffic on the range’s glaciers. One might think that many candidates for a ski run down the Vallée Blanche, currently hampered by the delicate descent of the Aiguille du Midi ridge, will be tempted by the easier access option of the Italian side and a more glamorous and brand new means of transport, but all will meet at the Montenvers level. While the passenger traffic at the Aiguille du Midi is expected to stay at least at current levels, in the coming years the contribution of Helbronner will lead to additional discharge of hundreds of skiers on the “Vallée Blanche” in the dangerous because crevassed “Plateau de la Vierge”, therefore a large potential security problem may be expected on French glaciers. What do the Mountain Guides and the PGHM think of that? To our knowledge there has been no consultation between French and Italian guides? Furthermore, the installed capacity is well above the rates that are deliberately limited by the operators. Are we sure that, over time, the temptation to push for more revenue will not be stronger than current limits set by self-regulation? In fact we are faced with 2 large tubes supporting heavy flows running together with, in between, a thin drip (the gondola of the Vallée Blanche). Is this a permanent solution? Should the ultimate solution not be to cut-out the link affecting the very heart of this exceptional site? As the “enhancements” of the Aiguille du Midi are intended to attract a new customers, it is reasonable to think that these tourists will remain confined in the immediate vicinity of the central peak so having relatively little impact on the environment but it is definitely not the direction taken by the facilities of Helbronner. The “Espace Mont Blanc” (an organization grouping the various municipalities of the 3 countries around Mont-Blanc for common actions) is defining a future strategy for the territory that involves multiple committees working on issues such as access routes to Mont Blanc, accesses to shelters/huts of the massif, outdoor activities, biodiversity, energy transition, motorized flyovers etc… . However, to date none of the major infrastructure development projects have been debated in this context, even though associations such as Mountain Wilderness have requested it several times. It seems surprising that in this mountain range, a protected area, where overcrowding is an acute problem, where tourism is a major economical component, that no public debate is taking place with the key players. One Response to "Mass tourism siege on Mont-Blanc"